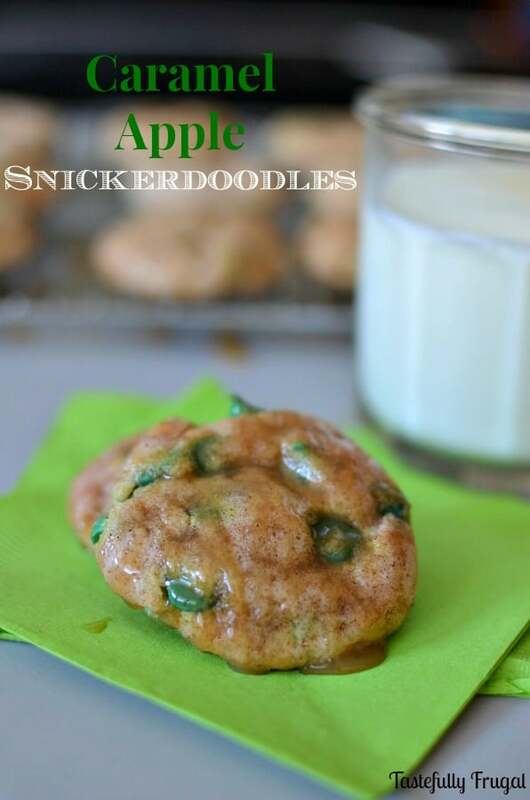 Combine the taste of sweet and creamy caramel apples with the soft cinnamon sugar goodness of snickerdoodles to get one tasty cookie! One of my fondest memories growing up was spending time in the kitchen with my mom and grandma making Christmas treats. 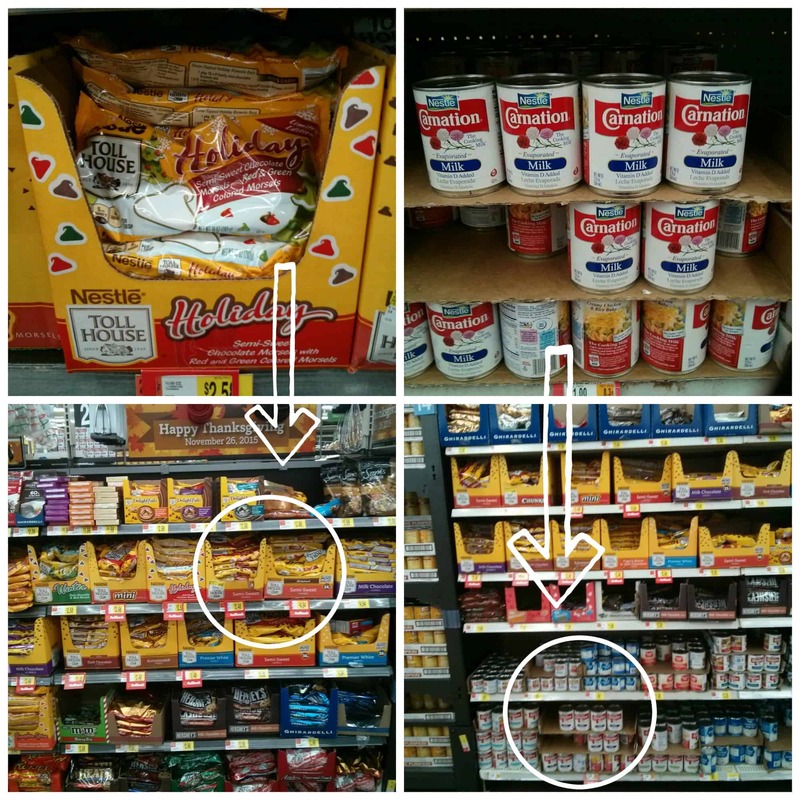 From cookies to candies to chocolate covered everything; I remember spending days in there baking up a storm. My love for cooking has passed down to my boys and they are always asking to make cookies or brownies. One of our favorite cookies to make together are snickerdoodles. You may remember the pumpkin pie snickerdoodles I shared last month on The PLACE. Since they were SO good we decided to make a new variation of them. For Halloween my mom made us all chocolate covered caramel apples (remember all the baking we did as a kid? She still does it!) and my boys were devastated when they dropped them in the dirt while trick or treating and had to throw them away. 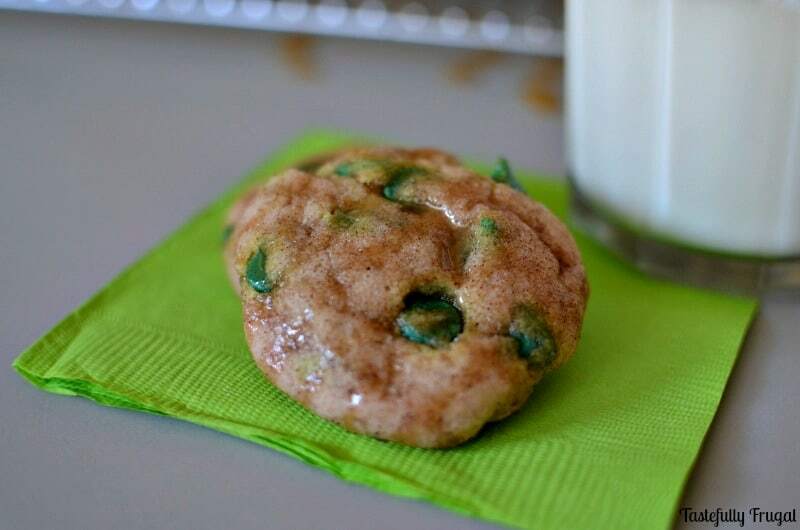 So I combined two of our recent favorites and made one super soft, super tasty ooey gooey cookie. 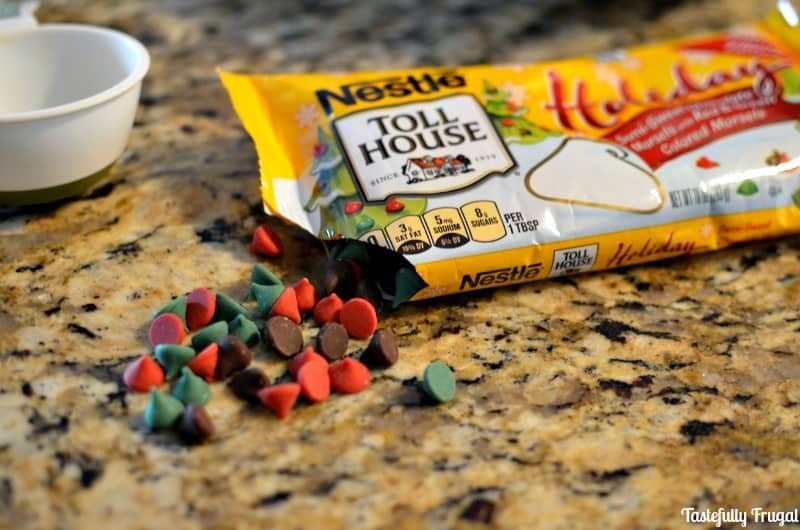 I started out by picking up a few of my favorite baking essentials (including Nestlé® Carnation® Evaporated Milk) from Walmart then added applesauce and these new Nestlé® Toll House® Red and Green Morsels. The end result was nothing short of fantastic! The snickerdoodles are soft on the inside and are topped with homemade ooey gooey caramel sauce. 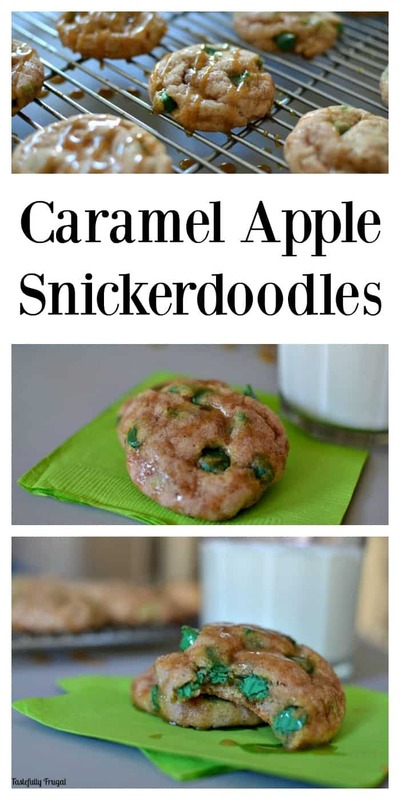 They taste just like a cinnamon sugar caramel apple! 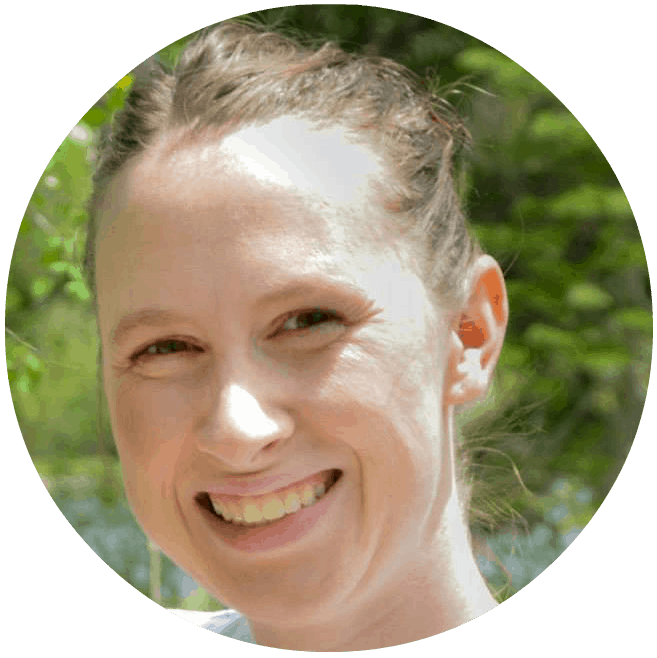 You can print one of these gift tags too (or go here for more fun printables), put a few on a plate and give them to friends and neighbors as a gift (if you don’t eat them all yourself). Combine butter, applesauce, vanilla, brown sugar and 1/2 cup sugar in a large bowl. Mix well until all lumps are gone. In a medium bowl combine flour, baking powder, baking soda, salt and cinnamon. Slowly add dry ingredients to wet ingredients and mix until fully combined. 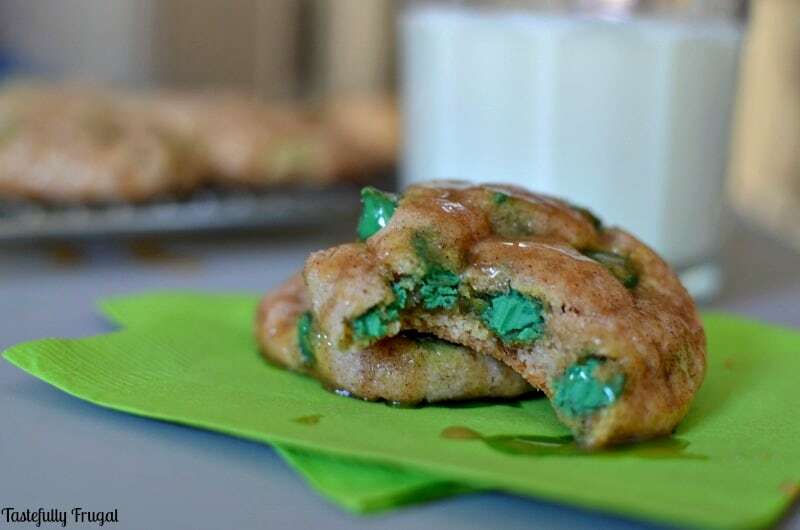 Dough will be sticky. 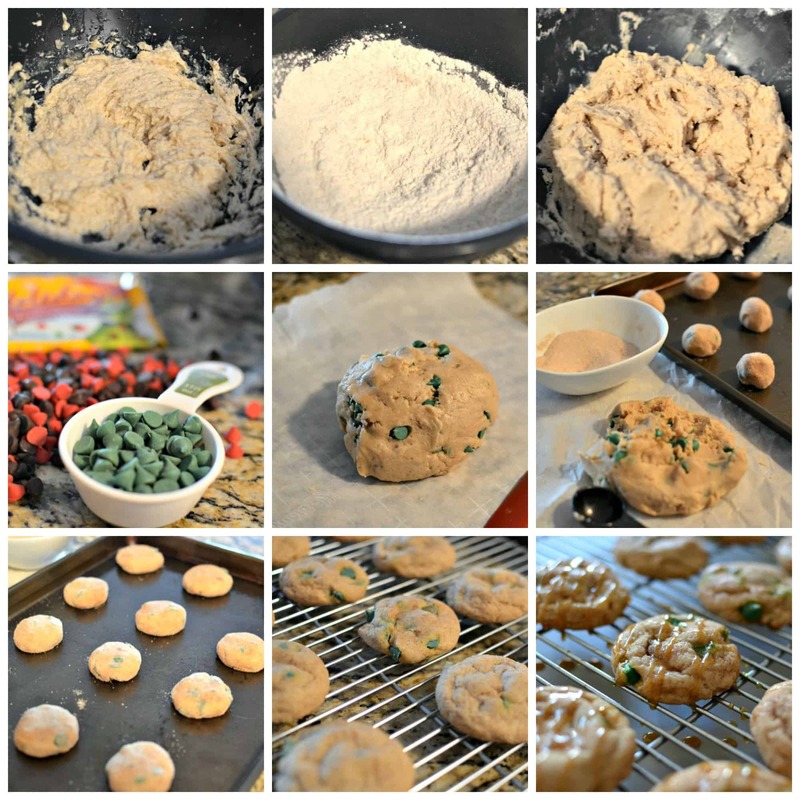 Divide green morsels from red and brown morsels and fold green morsels into dough. Chill dough in fridge for 30 minutes. Combine 1/2 cup sugar with 1 tsp cinnamon in a small bowl. Scoop dough into 1 Tbsp size balls and coat in cinnamon sugar mix. Place on a greased cookie sheet and flatten slightly with hand. Combine brown sugar, butter, water and salt in a medium sauce pan and bring to boil over medium high heat, stirring constantly. Reduce heat, let simmer for 5 minutes. Remove from heat and stir in evaporated milk and vanilla. You may need to add more evaporated milk to achieve your desired consistency. I used close to 3/4 cup but I like my caramel sauce more runny than thick. 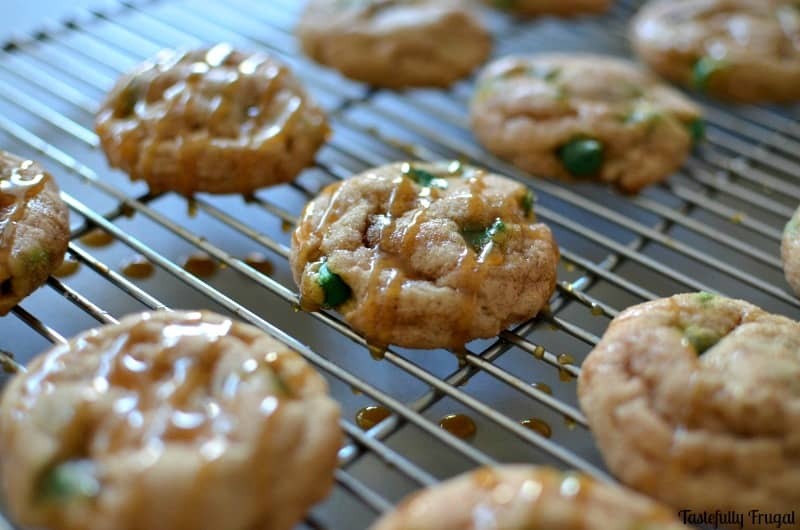 Drizzle cookies with caramel sauce. The cookies will look under done when you take them out of the oven but you don't want to over cook them. What’s your favorite cookie recipe? 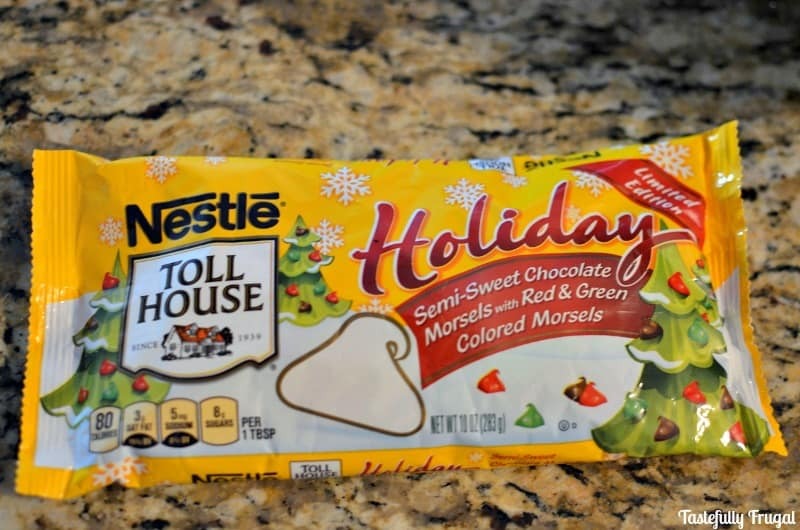 For more tasty recipe inspiration check out Nestlé’s Very Best Baking Site, the Flavorful Moments Pinterest Board or follow Nestlé® Toll House® on Pinterest and Instagram. These look so yummy Sydney!